In via sperimentale, il summary settimanale dei miei post, sarà anche in inglese. Ogni lunedì, compatibilmente con i miei impegni, ci sarà TrashFood weekly. –New functional foods in Italy. You can taste Pancor. Pancor, produced by Molino Vigevano, Vigevano (PV), is enriched with phytosterols, provitamin A and vitamin E. You can also read the study aimed to investigate the effect of Pancor on cholesterol levels of the (only) 15 subjects enrolled in the investigation. New products by Barilla will arrive soon. 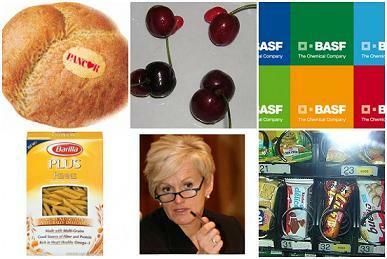 Bread, snacks and pasta enriched in fibers and omega 3 fatty acids. In USA Barilla plus, a pasta enriched in fibers and omega 3 fatty acids, is already available. –Food hospital It’s well known that hospital food is an essential part of patient care. How to eat healthier and Mangiare sano in italian hospitals? Slow Food and the Health Minister Livia Turco signed an agreement aimed at raising eating standards by using the best of the fresh, healthy local produce Italy. – Local products, healthier snacks and other news about food in the hospitals of Emilia Romagna. –Transgenic and non-standard foods When will start the coltivation of Amflora, la patata transgenica , in Europe? Meanwhile, look at the Mutato gallery of the German artist Uli Westphal. You can find a photo-gallery of “nonstandard fruits, roots, and vegetables” found at supermarkets and farmers’ markets in Berlin. –Poultry meat labelling Under legislation adopted in August 2005, Italian producers and the first recipients of poultry meat are obliged to indicate the member state of origin of the meat. The labelling must also state the date of import for poultry meat and products coming from other member states and non-EU countries. Now the European Commission is threatening Italy with legal action for imposing overly tough labelling requirements on poultry products imported from other EU member states. What do you think about that? –Trashfood photo-album Have you seen the new photos uploaded in my photo-album of Flickr? Avverto che il trackback sopra è a tutti gli effetti spam.